Teach Soap • View topic - Soap Queen TV suggestion? Post subject: Soap Queen TV suggestion? 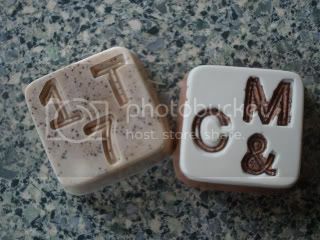 I just saw these soaps and they are fan-tas-tic!!! Could I be so bold as to suggest a Soap Queen TV episode on doing them? I'd adore to see how it's done. Post subject: Re: Soap Queen TV suggestion? That's a great suggestion - maybe for next Valentine's Day? Or if I find some other cool stamp things at the Dollar Store again. I am loving your episodes on utube! Any chance you'll come out with a dvd with all the episodes on there? Thanks Anne-Marie... your description was good but I sometimes need to see how to do things visually you know? I'm also loving the episodes.. saw the new one last night and I love it! Well, here's my attempt ... Anne-Marie, your's are so much cleaner than mine though. They're ok but need work. Do you need to make a master in reverse, so the impression on the soap comes out the right way? 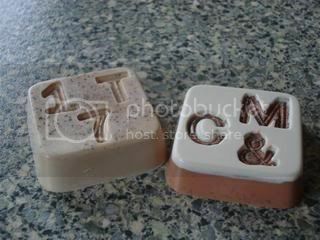 Hi Soapbuddy - you put the stamps in the bottom of the mould and what I did was hold the mould up so that I would see what the top of my soap would look like (bottom of the mould being the top of the soap of course) and so that I got the lettering straight etc and it worked fine. It is a little confusing and until I got the stamps, I didn't really understand how they'd work! It does seem a little odd cos I thought they'd come out back to front too. Anne-Marie got her stamps really inexpensively but they're not that cheap over here (no Dollar Stores here, poo!) but if you find any stamp that's cheap, just get it and try with it ... experimentation! You can get ones with pre written phrases (congrats, happy birthday etc) which would work well. It's interesting but I find with the two layered ones that I get overspill of the white on the darker colour and I'm not that great in tidying it up ... would ADORE if Anne-Marie made a video on this as I think it'd be a real hit with people. Mine are a little raggy round the edges at the mo but I like the effect (and the one colour is far far easier!). Ugh, tried it again today and messed it up totally. Not easy. I don't have that kit specifically but do have a whole kit of sculpting tools - courtesy of my hubby who used to use them when he was a jeweller. It's a tough one to do.. I've ordered some more stamps and hopefully they'll be a little easier. I love the idea and want to master it! Oooh! Oooh! I have a suggestion. Can you do a tutorial on how to cut up & store the 25 lb boxes of M&P base? I cut up (ie mangled) up one box of clear, and I've just been chipping away at my white box. Duly noted - video on chopping up a 25 pound block of soap and video of doing the rubber stamp concept. Honey, I love the way your soap turned out. It looks great! Thanks Ann Marie and thanks for your recognition on your blog, I was very happy! !